My personal motto is, “Live all the way.” And, girl, do I ever. I have made it my mission to live a life that is full and adventurous and BIG. I scrape together enough money to travel whenever possible. I take on hundreds (okay, maybe only dozens) of projects at a time. I explore new foods and meet new people and attempt to experience as much as I can of the world around me. But I also live a life that is small—I try not to collect too many things. I have an old beat-up car that might not make it much longer, but I don’t really have the heart or the finances to replace her. I have repainted and repurposed all kinds of things rather than collecting something new. I am trying to slow down more and gather moments to rest and pray and be still. My latest endeavour is both my BIGGEST and also my littlest project to date. It is grand, noisy, ambitious … and it’s parked in my sister’s driveway. 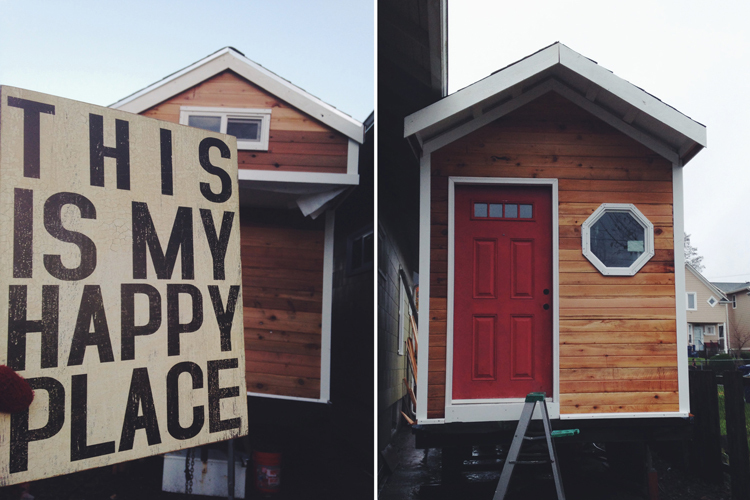 I dare you to Google “tiny house images.” It’s okay, I can wait for you to come back. As of right now I have a nearly completed exterior, lights, outlets and running water (even hot water). But I’m still walking around on a subfloor and staring at insulation instead of interior walls. I don’t always know how to talk about my tiny house in the making. The only time I know what to say is when I talk about the incredible people who have helped along the way. I can sit at the edge of my wine barrel shower basin and talk about Janet and Todd, my café regulars who gave me the barrel and all the electrical wire I needed to power my house. They brought over a tiny bottle of wine to celebrate when I do move into my home. I could jump up and down on the sturdy frame and brag about my not-so-little brother who spent a whole weekend teaching me how to frame in windows and doors and roofing beams. I have stories from the edges of construction site dumpsters that provided studs and wall panels and trim and insulation. There is a skylight that lets me see the sun and the rain above my future kitchen sink. A stranger named Ben gave me the skylight and my new friend Jeff came over a few weeks ago to install it on a much-too-cold day. Oh, and that spot where the sink is going to go? That sink—that glorious, white, farmhouse sink—was sold to me for $40 by a cabinet-maker a couple miles from my house. I can look at nearly every corner of this absurd little house and tell you about how much my sister, Adina, loves me. She is not only letting me build a house in her driveway, but she is helping me every step of the way. She has solved plumbing puzzles and read electrical books and wielded a left-handed saw, all on my behalf. My teeny tiny space is quickly filling up with all kinds of treasured tales. And I think I finally figured out how my need to live BIG and my desire to minimize can work together to make something new and grand and quiet and quaint, all at once. Little late to the game here, but I’m going through all these past posts about your house happening and it’s so very cool. You should be really proud.